Drag Racing makers have come out with yet another racing game for Android and all fans of the genre are recommended to try it out. Creative Mobile promises to take “drag racing to the next level,” offering 3D graphics, highly customizable vehicles, excellent racing physics and highly detailed game play. Nitro Nation Online requires Internet access, as you might’ve guessed from the title, and it focuses on multiplayer mode with the possibility to create teams and advance through leader boards. 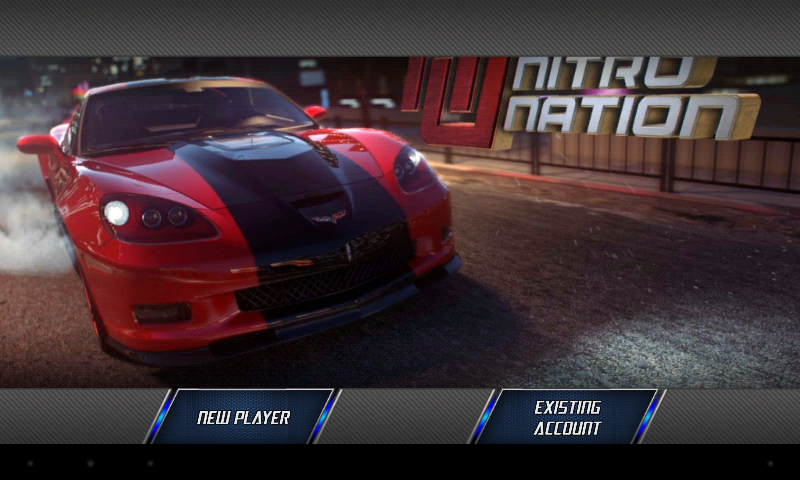 Being a freemium title, Nitro Nation offers in-app purchases if you want to customize your vehicles. A rich selection of more than 50 licensed cars from Mazda to Alfa Romeo and BMW. The possibility to customize vehicles in colors, tuning and more. The availability of 80 achievements makes progressing quite rewarding. You can join a club and compete with its rivals to ascend in the leader board. Nitro Nation online focuses on 60-foot time concept, which determines how fast the car performs throughout the entire race. The game indeed features excellent graphics and a large number of customization options and a rewarding game play, which is rather fulfilling to master. The plot is quite simplistic – you need to get to the finish line as fast as you can beating your opponent. The controls are quite simple, yet difficult to master. Controls are your major challenge, but once you have sorted them out, you will start experiencing a very addictive game play. Here’s how you race: once you tap the gas pedal on your right, you will see the countdown timer start. Your goal here is to hit the sweet spot to launch by reaching the perfect RPM (revolutions per minute) by the time the countdown timer hits 0. The race begins and the only controls you have is the shift, which you need to tap whenever RPM meter gets into that 60-foot spot to launch your Nitro on your left-hand side. As easy as it sounds, it appears to be quite difficult, especially at the beginning. Every car is different, so every time that perfect spot is difficult to reach, and whenever you upgrade the same car you will have to adapt again. 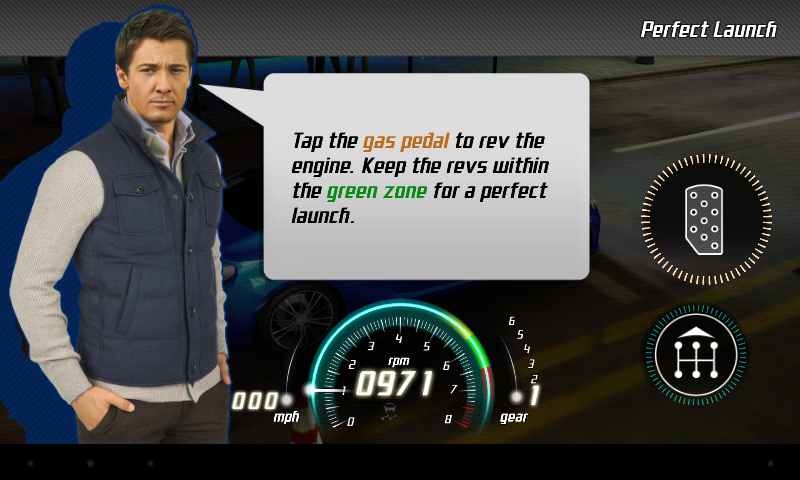 The RPM meter is intuitive and you will see that perfect spot marked by the green color, so try to aim there. The 3D visuals are really cool and the soundtrack, taken from the original Drag Racing, create the perfect environment and mood for the game. Overall, the two detailed tracks are depicted with high precision, and the nighttime drive spectacular lightning effects are my favorite. The colors are lush and the shapes are very realistic, creating excellent visual experience. The only downside of the perfect visuals and cool sounds is incredibly long loading times. Sometimes, you have to question whether the game is loading crashing on you, and there are quite a few moments when the game needs to load. So, your gaming experience will depend not only on your hardware, but also on your Internet connection. Basically, the races themselves are very short, approximately 10 to 12 seconds each, and the remaining time you just have to wait for this or that element of the game to load, which can impede the immersion sometimes. You have the training mode, you can join The International Track Racing Association o become a member of the racing club and adding some cool power-ups competing with other players. Story challenge mode makes you compete against the game artificial intelligence. Even though you never feel like you’re competing against the computer because the characters are personalized and you can see a picture of your opponent and the quote from him challenging you. The story challenge mode also enables you to unlock crew members, quite helpful in a lot of ways. For example, they can help you to test drive new cars and give you instructions on when to shift or use your Nitro. 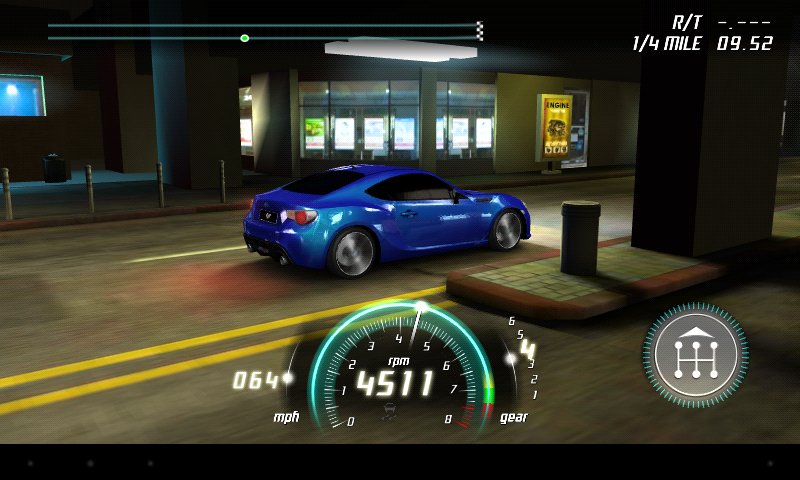 Then, there is the street race mode and the tournament races mode where you get to compete with real time players. It is exactly these modes that make the most of the fun in the game because it’s a whole world, an entire community of street racers, where you can show off your skills and earn respect. Of course, it is not the same as the real world drag racing, but nevertheless it is fun and addictive, especially with the large number of cars to unlock and customize. There are more than 50 cars to buy, and a huge gallery of customization options from cosmetic tuning to enhanced speed and power. At some point, you may feel like customizing doesn’t do much but that can change when you start competing against other players, and see how posh and brilliant their cars look. Every time you win the race you get some cash you can spend on upgrading your car, and the downside is you have to upgrade your car every 2nd race if you want to advance and keep winning. The catch is you will start losing even if you hit the perfect launch and use your Nitro at the perfect moment every single race, unless you upgrade your vehicle. This creates a little bit of a problem because you will have to lose 5 to 6 races just to upgrade a little bit your car, if you don’t want to spend real cash. Sometimes it may feel a bit annoying. As you race in online tournaments against real users, you will feel that annoyance evermore if you’re not spending real money and compete against users who have bought some cool upgrades for their cars. On the other hand, in-app purchase offers are not obscene or overly intrusive and you never feel like you’re forced to buy anything. 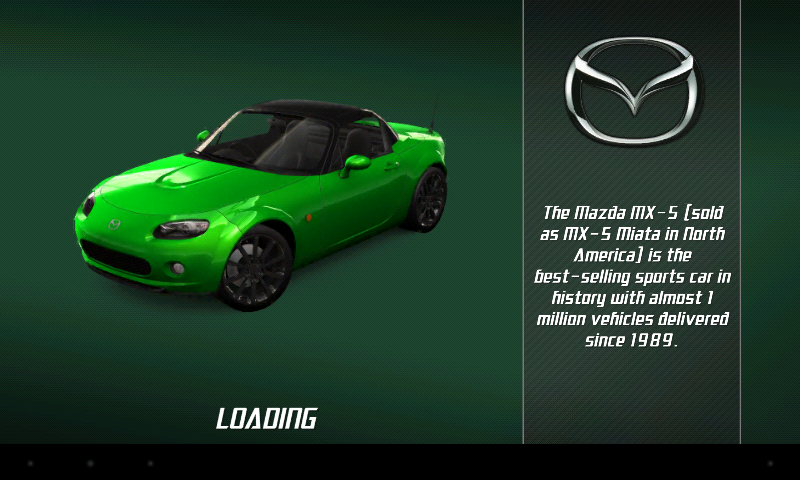 Achievements will help you customize and upgrade cars, and there are over 80 achievements to make you feel rewarded. Winning your 1st race, or upgrading your 1st car, or winning the entire tournament are some of the achievements that come with rewards. Nitro Nation Online is a beautiful drag racing game with a vibrant online community that will make you jealous of the luxurious cars of the best of the crop on the leader boards. Very rich gallery of customization options and achievements create addictive and rewarding game play while competing against other players allows you to feel a sense of belonging to the drag racing community. Two main downsides here are the loading times and the difficulty of upgrading without resorting to in-app purchases. Other than that, it’s a must-have item on your Android tablet.